treat has also been added – Sticky Multipliers. 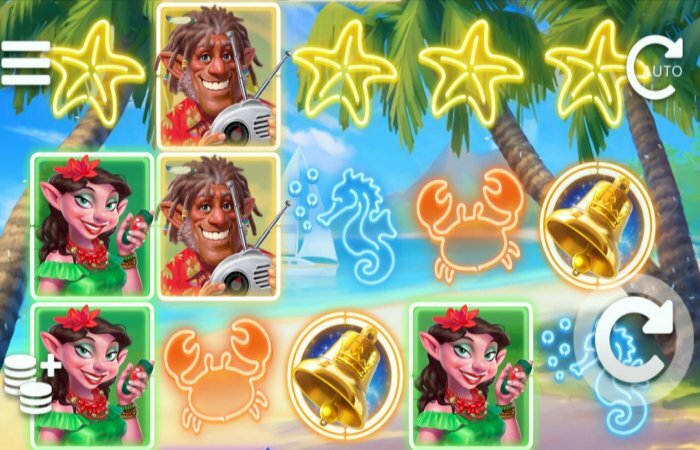 Sam on the Beach is a lighthearted, feel-good slot with an exotic Caribbean theme. Beach Memories Respin feature is available in the base game, and it offers a respin with Sticky Wilds replacing four side to side connected character symbols on the same row. This feature can stack up to three times. Uncle Ted’s treasured ship bell signals the start of the Free Spins bonus game. Three bells equals 5 Free Spins, four bells equals 10 Free Spins and five bells equals 15 Free Spins. Each additional bell during Free Spins gives 1 more Free Spin. All the characters have their own special feature, called Electric Treat, which is triggered when they hit during Free Spins. Sam’s, Sandra’s and Ted’s treats are all performed immediately, prior to any payout, and are valid for the remaining Free Spins. Maggie waits for payouts to be made before performing her treat, removing all low value symbols together with herself for a partial respin.